Why are Banksters in Ukraine? is exposed by this well documented Film offering details of its bloody work, promoting wars to foment debt among societies. The CABAL of financier families who form this source of infection affecting the planet for over 300 years now, has its days numbered given the many books, press articles and videos that are finally being released explaining the evil nature of the well developed ingrained corrupt money system of fraud our societies are being caught in. Consciousness is the only antidote against the hidden in-front-of-our-eyes subtle, ritual of money creation they have been using to enslave the rest of the productive sector of humanity for 3 centuries. However, their unlimited greed driving them to consolidate their criminal enslaving system by forging a NWO (New World Order) forcing all of humanity to live under a single money system, for their convenience..... has been their undoing. Now we have the people this CABAL disrespects so much after so many years of treating us as their "animal farm" productive beasts, waking up in numbers to realize the lies and the robbery we're suffering, demanding a substantial change to bring about a new form of exchanging our services and products without allowing these families to plunder the wealth we're creating with our productive work. It is about time for these lazy bankster criminals to start working productively for the first time in centuries, while the masses of people finally get the full reward of their productive work. THE FACT IS WE ARE ALREADY PRODUCING SO MUCH MORE WEALTH THAN WE'RE TOLD. Once we take away the chains these families have us ensnared in, and the defrauding is stopped, then it will be much clearer how much wealthier the world societies are. 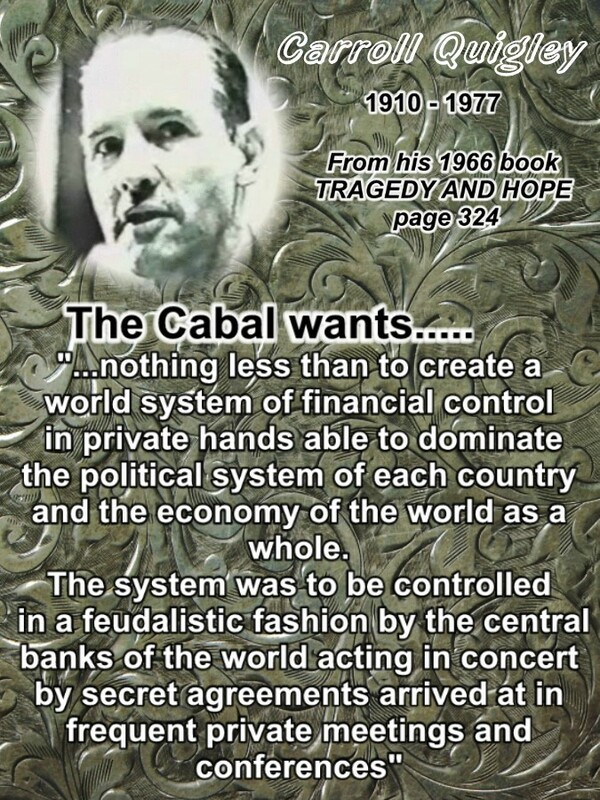 THIS CHANGE DEMANDS A NEW SOCIAL ORDER, but not the NWO these crooks had in mind to force upon us. We are so used to being raped and robed by this CABAL of crooks, most of us are unaware of the psychological nature of our prison. The financial "narrative" we have been trained like dogs to accept and adopt as our own, has to be replaced by a new narrative where the way these crimes have been committed is clear and obvious to stop any recurrence from ever happening again, because as we have seen in so many life times, these crooks have been stealing from very smart industry leaders, inventors, politicians, and hard working intelligent fine people who, like us, also were duped into believing in this IDIOTIC ridiculous Debt-Based monetary trick which we accepted as "our own" without properly understanding it. These bankster crooks have us to accept THEIR banking system not only as Debts-Based money but also we are stupid enough to let them have Tax havens like the Caiman Islands etc. where hundreds of billions of capital profits are "disappeared" to avoid paying legitimate taxes, forcing all salaried productive workers and most of their bosses to cover the huge tax bill these criminals don't pay while benefiting of a well run efficient economy with a working judicial system, obedient citizens working and consuming. These crooks controlling the money interest levers generate bubbles to inflate the economy to create great affluence and optimism, for then crashing it to be able to purchase the biggest companies manufacturing the best products from the clever inventions the best human minds can offer. And all of this they can do by simply punching numbers in a computer to create digital dollars and euros like a child's play. The crooks make profits on the way up during the economic expansion, and also during the way down after they crash it. DERIVATIVES are no more than a variation on this illusory money games they have become so caught up into, they actually destroyed the world economy in 2008 due to their stupidity. But having the control of the scumbag politicians in most countries thanks to the fake money they create out of nothing with which they corrupt them, again it is the victims who are paying for their abuse. In the US Obama obediently assumed all the bankster's debts into the US treasury to hang it from the 320 million inhabitants, while only Iceland was clever enough to do the right thing. There are several ways we can go about solving this crooked system, and all of them demand we the people in the community maintain the control of the exchange form of trading to make sure it benefits all those who actually create the wealth. Credit-Exchange centers provide this important service without the use of money at all, only a measuring unit needs to be agreed upon by the traders. Local currencies administered by the community is another form we can use to achieve the same independent aim. Our current "narrative" of democracy will have to change in order to give real power to the community and avoid the crooked politicians that sneak into our current flawed system, with too much power. We need a form of using "regular people" to do the community jobs we require for limited periods of time, and let them return to their productive activities once they are done. It is imperative we end "career politicians" who get entrenched into the community work and are much more susceptible to corrupt. A system were the community can recall a minister at any time if they feel she/he is not performing to its benefit, is necessary, while of course leaving a space for the community work to be performed in a reasonable period of time. What seems to be clear is we need to evolve into a new narrative as a society where money is recognized as the simple measuring unit it is, and never fall again for the fascination people feels for it today, which pretends to be a substitute for the inherent value of the products and services it can be exchange with. This "magical" fascination probably comes from the fact our entire lives have been spent struggling in a debt-based monetary system that by design NEVER HAS ENOUGH MONEY to pay for all the debts it creates, and even if it did, still this system is designed to choke itself for the lack of currency in circulation if the community ever tried to pay all its debts at once. This is the system we have been duped to accept as our own for all our lives, without ever properly understanding it, and this in itself is a lesson we have to learn well in order to avoid it in the future. But 11 Standard & Poor's 500 Index giants paid no income tax in 2014, even though they reported a profit for the year according to USA Today. Forty-three more were at least partially exempt. That means there are a record 54 U.S. corporations that pay no taxes or are at least partially exempt. That's more than twice the amount five years ago. Most of them actually got tax refunds. By keeping their cash parked overseas, companies like CBS avoid triggering U.S. corporate taxes. Instead, they take advantage of foreign tax structures that are much more forgiving. You see, according to Cato Institute research, the U.S. has the highest corporate tax rate among major industrial nations. Its effective tax rate of 35.6% on new corporate investment is nearly twice the average rate for the 90 countries studied. As these giants dodge taxes, it's no surprise their contribution toward the nation's total tax revenue has declined. In fiscal 2014, 10.6% ($320.7 billion) of the federal government's total revenue came from corporate income taxes, according to Pew Research Center. Comparatively, corporate income tax accounted for between a quarter and a third of federal revenue in the 1950s. The most decorated general in USA Smedley Butler, was asked by those bankers who finance BOTH sides of conflicts to help them do a COUP against FDR in 1933, but their plot backfired.